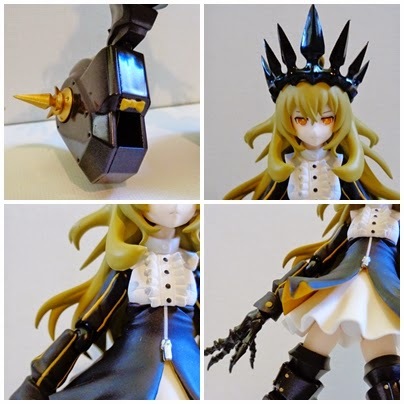 Chariot is yet another character in the Black Rock Shooter series and is the TV animation version. She is pretty character accurate capturing the powerful and cold demeanour of the character well. 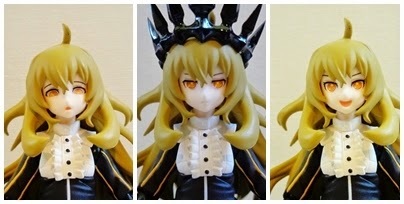 Her paint work is very good however you do want to be careful when removing her crown because during the course of a photo shoot the black from it started rubbing off onto her head especially her little sticking up piece of hair. Also I had a minor defect on one of the face pieces but nothing that a ear bud and a little bit of nail polish remover couldn't fix. Her movement is limited in some areas due to restrictions of character design, her knees can't bend back of extend very far same goes for her feet which can make balancing her a bit fiddly in some poses and like all long haired characters although her hair is articulated it does restrict her from looking up. Chariot comes with three facial expressions a neutral one, a happy one, and a lustful hungry one? 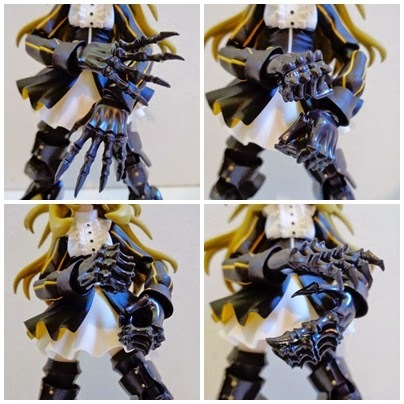 She has four pairs of hands with two extra, one for holding her sword and one specially for holding her macaron. 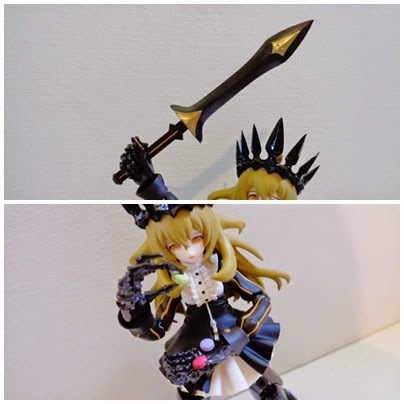 She also comes with her sword which to me feels kind of small especially compared to her shield. She has three macarons one of which has little indents for slipping it in between her fingers and it works very well at holding it in place. Now one thing to be careful of is that these macarons are super small and I can see them almost getting lost all the time. Now her biggest accessory is her shield which is almost the same size as her. 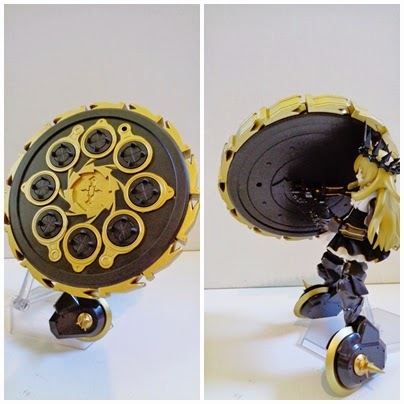 Chariot comes with two stands which is handy as you will need one in order to pose her with the shield and she holds it fairly well with the hand used for the sword. However when I tried to recreate on of the shots on the back of her box I could not as her other holding hands are pretty much impossible to get onto the handle of the shield so it ended up being a trick shot with no hand at all. 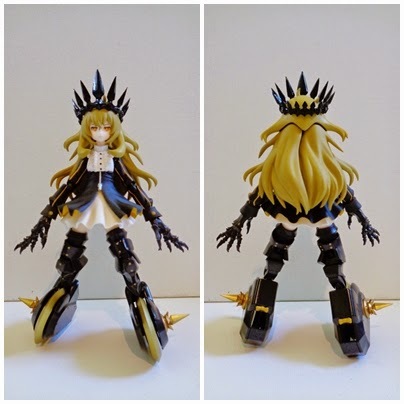 Despite a few flaws and some what I think will be continual paint rubbing I am glad I purchased her as she is just such an awesome looking character, I mean just look at that crown its freaking wicked, and her wheels actually spin an the sharp pointy spikes on her feet and shield are really sharp and pointy. Definitely a must have for collectors of the Black Rock Shooter series.